Ok, so start by making your ‘noodles’. You will need a nifty ‘noodling’ gadget, it looks like an old-fashioned potato peeler with little slits to create the noodles. There are so many different gadgets around for making noodles out of veggies – take your pick, or simply slice them into thin ribbons. Steam them for a few minutes until just tender and set aside. 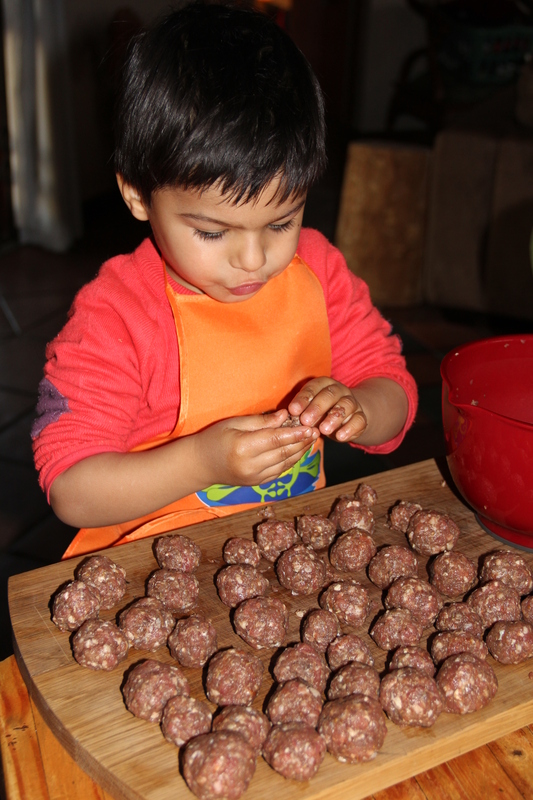 To make the meatballs, remove the sausage meat from its casing. Mix in the egg, spices & salt. 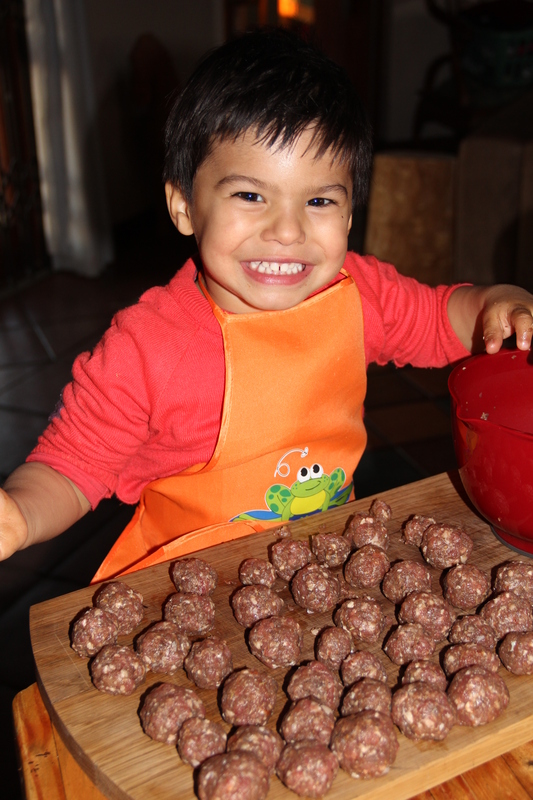 Get a pair of teeny tiny hands to roll these into small meatballs – a 3-year old will do! Fry in olive oil on all sides until they’re a nice golden brown. Slice the spring onions and add these to the frying meatballs. Add a splash of wine and the tin of tomatoes. Let this simmer away for about 15 minutes until the sauce has reduced slightly. 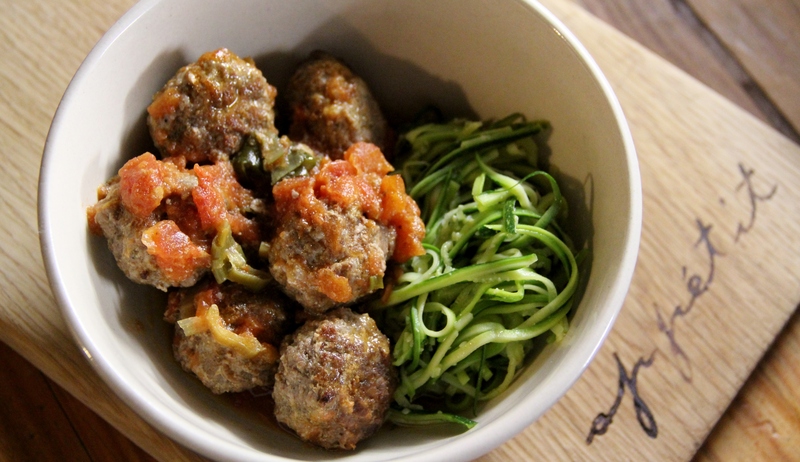 Serve with the zucchini noodles and a drizzle of olive oil. By replacing regular ol’ spaghetti with lighter, more refreshing zucchini noodles, this dish is instantly a more healthy, carb-free, family-friendly meal! What’s for dinner? Lamb shanks – that’s what! Reblogged this on Foodie goes Primal.